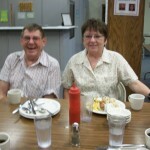 The Fergus Falls Senior Citizens Program is a great place to socialize with friends and watch your social network grow. We offer a variety of programs to fit the needs of all senior citizens from 55 years of age and older. 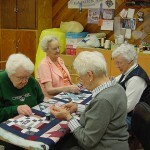 Some activities offered are: quilting & crafting, pinochle, bridge, whist, hand & foot, Red Hat group, Adopt-a-Class, entertainment, special events, exercise classes, bingo, greeting card recycling, bunco, discussion groups, Zumba Gold, line dancing, memory screenings, library with magnifying reading machine, eight-ball pool and snooker, paint classes, informational seminars, and volunteer opportunities. Our Exercise Programs are Top Notch! We offer the Life Fitness Circuit Series for strength training, plus a hip abductor, three NuSteps, two TechnoGym Excite Jog treadmills, two Technogym upright LED bikes, a TechnoGym Crossover 700, SCIFIT climber, SCIFIT elliptical, and a SCIFIT recumbent/arm bike that is wheelchair accessible. Orientation classes to use the equipment are held with a certified exercise instructor prior to using the equipment. After an orientation session to the equipment, members are welcome to use the equipment anytime during Senior Center hours (Note: some equipment unavailable during circuit training class at 10:00 a.m. Monday and Thursday). We encourage participants starting a new exercise routine to have a discussion with their physician prior to using the equipment. 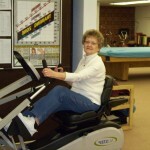 The Fergus Falls Senior Center is a Silver&Fit® participating fitness center! Silver&Fit is designed specifically to help older adults achieve better health through regular exercise and health education. Silver&Fit provides eligible members with no-cost or low cost fitness memberships through arrangements with certain health plans. Silver&Fit is provided by American Specialty Health Fitness, Inc., a subsidiary of American Specialty Health Incorporated. If your health plan offers Silver&Fit and you would like more information about the Fergus Falls Senior Center, please contact the Fergus Falls Senior Center at 115 Lincoln Ave. W, or call 736-6842. You may also visit Silver&Fit at www.SilverandFit.com. Silver&Fit is a federally registered trademark of American Specialty Health Incorporated. We provide services beyond the walls of our Senior Center through the Senior Companion Program service. Follow the link highlighted in blue to learn more about the program. The program is funded by the City of Fergus Falls, membership fees and fund raising efforts. Nutrition Services, Inc. operates a congregate nutrition program at the Senior Center Monday through Friday at 12:00 noon. They also prepare Meals by Wheels which are delivered by volunteers. Nutritionally balanced meals consist of such entrees as barbecued ribs, pork chops, chicken, roast beef, turkey, casseroles, plus all the trimmings. Frozen meals are also available. Suggested price of a meal is $4.00 for people who are 60 and older. People under 60 years of age are welcome to attend for a suggested price of $7.00. Please register in advance if you plan to attend. This program is funded by the Older Americans Act and administered by the Land of the Dancing Sky Area Agency on Aging.